Over the last few years, I decided to run a few ultra-marathons (marathons run on trails in the forest). And I must go on record by saying that maintaining fitness is much easier than trying to get in shape to begin with. It was an arduous journey trying to get ready for my first event. But when our bodies are used to a certain routine over time, it becomes the new normal. In essence, we train in order to raise the bar for a new level of expectation. You wouldn’t think it, but pianos can be in shape or out of shape. 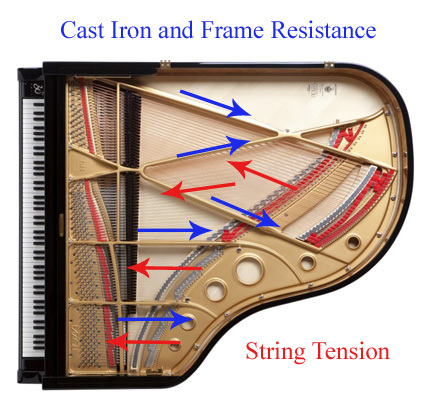 Pianos can go out of shape mechanically in the way that they play but can also get out of shape in the strings which determines intonation or pitch. Today I’d like to take a brief look at a bit more of a structural and mathematical concept of tuning and pitch. Before we do, we need to examine how and why pianos go out of tune and when you understand why they go out of tune, there is greater understanding with regards to getting them in shape and maintaining tuning stability. 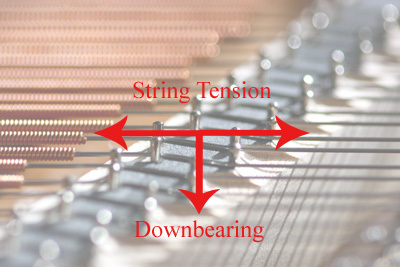 Pictured above are the 3 types of strings on any piano. When you depress a key on the piano, it activates a hammer that strikes the strings. Depending on the zone (high or low), there are different types of strings. The largest bass notes are called mono-chords and only have one string per note. The double stringed notes are called bi-chord where the hammer strikes two notes simultaneously. And then for the top 2/3rds of the piano, a set of 3 strings (tri-chord) are struck simultaneously by one hammer. 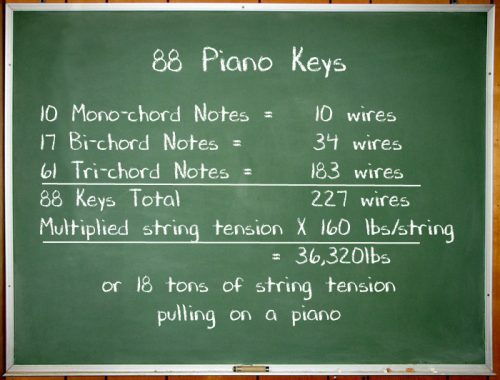 As seen on the chalkboard, there are 88 keys on the piano. When we separate the notes by type, we see that there are approximately 227 wires (which vary depending on the design of the piano). Multiply this total by the tension from each string (approximately 160lbs per string) and this gives the grand total of 36,320 pounds of string tension pulling on any piano! Note: the string tensions vary from maker to maker, model to model but also within one piano, the string tensions vary considerably. These are simply averages to grasp the concept of how much tension is pulling on the frame. Conservatively, the piano has 18 tons of tension (36,000 pounds) pulling simultaneously and that number can reach almost 30 tons of string tension for larger concert grands. The wires then pull with an incredible force or tension. The cast iron frame (pictured in gold) together with the structural beams resist this tension. It’s a constant tug-of-war. The strings pull while the cast frame resists. Slight variations in this tension result in change of pitch and an out of tune piano. The question then is: what factors change the pitch of a piano? 1. When it comes to change in tension, strings when installed at the factory will stretch. You wouldn’t think it but new strings have considerable stretch in the steel. The windings, knots and coils will also tighten and stabilize. This only applies to brand new pianos. There is a finite amount of stretch that will happen with new strings and within the first few tunings this will no longer be an issue. There is wisdom in tuning new pianos more frequently until the strings feel like they’ve settled. 2. 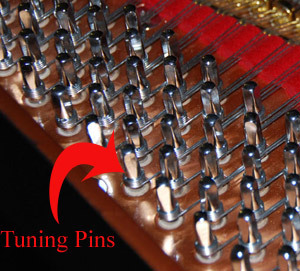 The tuning pins are the adjustable “pegs” that technicians loosen or tighten with a tuning hammer. They are friction fit into the pinblock ~ usually a multi-laminated plank of wood. Interestingly, in England, they refer to the pinblock as the “wrest-plank”. The word “wrest” (similar to wrestling or wrench) denotes forcibly to pull or in this case, to turn the “wrest pins” (or tuning pins) inserted into the wrest-plank. Because the tuning pins are friction fit into the pinblock, they must have the correct amount of torque (the measurement of how tight fitting the pins are). Too tight and the pins becomes too difficult for a technician to adjust. Too loose and the tension of the string pulls on the pin resulting in loss of pitch. Tuning pin torque then is a significant factor that affects tuning stability. 3. Probably the greatest factor affecting pitch, however is the soundboard. The soundboard affects the tuning stability insofar as the strings cross over the bridge which is connected to the soundboard. In the picture you can see the strings cross over the bridge (adhered to the soundboard). Not only are the strings pulling end to end, but there is something called down-bearing where the strings are pushing down on this bridge. Since the soundboard is comprised of wood, it is subject to environmental conditions. Seasonally as the soundboard absorbs or dispels humidity, the soundboard will arc or flatten slightly resulting in pressure on the strings. Pianos can even go up in pitch if the arc puts considerable pressure on the strings. Pitch is not simply some arbitrary sound but rather, it has evolved into more concrete, measurable and universal terms. A440 is the global standard. A is the note (just above middle C) and 440 is the frequency or speed of that wave measured in Hertz (named after Heinrich Rudolf Hertz accredited for conclusively proving electro-magnetic frequency waves). 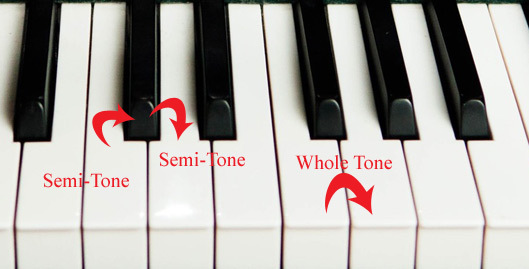 When it comes to piano tuning, while you can measure Hertz, you can also define pitch in degrees called cents. As seen in the picture, each semi-tone has 100 degrees or cents. A full tone then has 200 cents. What this means is that there are 100 increments or degrees of pitch from one note to the next neighbouring note. So in discussing pitch, being a math and facts guy, I like to know how many cents the piano is out of tune. A piano that is wildly out of tune will be 40 cents flat (pianos usually go flat rather than sharp). So 40 out of 100 cents, if a semi-tone is 100 cents, that piano has fallen in pitch 40% of a semi-tone! Pianos that are tuned regularly might only go out 1-3 cents (out of a total 100). Often, pianos might go out of tune 5-15 cents in a year. What does this depend on? The 3 factors we looked at above. If your piano has gotten over “new string” settling when the piano is first purchased, then that leaves tuning pin torque and soundboard fluctuation as main factors determining pitch or intonation. The pinblock and soundboard will change with humidity. Pianos LOVE stable environments. Baseboard heaters, fireplaces, direct sunlight, drafts… even excessive fish tanks, plants all have bearing on humidity in the room which affects the soundboard which in turn affects the tuning. Change in ambient temperature (and subsequent humidity) within the house but also seasonally will make micro-changes in strings which also create difference in pitch. There’s a saying about piano tuning “You can’t tune a piano unless it’s in tune”. Paradoxical? It sounds that way unless you understand the sentiment. The farther out of shape your piano is, the more the tug-of-war will happen. The strings get pulled into shape, the piano tries to pull back to its known comfort zone. If a piano is 40 degrees out of pitch and you raise it to concert A440, guess what ~ your piano will not be at A440. Why? Because the tug-of-war is happening. The soundboard is adjusting to a new level of fitness. The subsequent outcome is that most pianos will pull back ~ sometimes up to 1/3 of the raise in pitch. So let’s take that example of 40 cents. One third of 40 is roughly 13. After tuning to A440 once, the piano will respond by possibly dipping down as much as 13 cents. Most technicians compensate and tune a little sharper knowing that this pull-back is going to happen. And so here’s the part that technicians CAN’T control. They can’t control the adjustment of the piano and the subsequent pull-back in 225 strings. Those strings will pull back at varying rates and thus, one tuning will never do the job getting a piano into shape that is vastly out of tune. The only way to do that is to tune again. You can really only tune a piano when it’s in tune ~ meaning that unless it’s close to pitch, you will never be able to get an exact stable tuning the first time. It is better to keep a piano consistently in tune than to let it drop significantly and try and pull it back into shape.